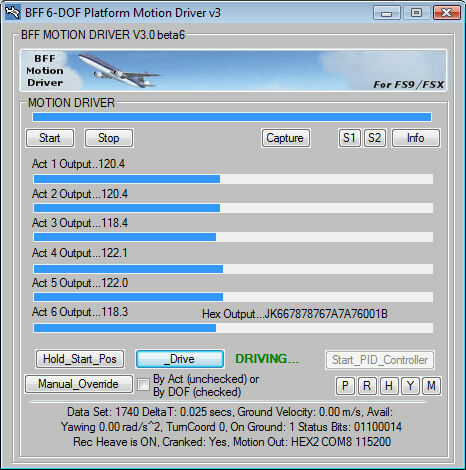 6 DOF Motion Software for Hexapod Flight Simulators. Interested in 6 DOF motion hardware - then check out Thanos' Kickstarter campaign for his AMC1280USB controller. How to Purchase 6 DOF software - please email and I will send you a PayPal email invoice. Your unlock key will be issued following payment. Motion software for 6 DOF hexapod or "Stewart" type platforms is now available. The 6 DOF motion software is available for FS9/X, X-Plane v9.6+ & 10 and Condor Soaring. Versions are also available now for racing sims rFactor, Assetto Corsa, F1 2013, Live for Speed, iRacing, Project CARS and GPBikes. A "Generic" version is also now available which is not tied to any specific flight or racing sim but can be driven from user supplied data via UDP. Recently added - a new version for Aerowinx PSX flight simulator; and now a version for DCS. The online user guide provides information on installation and operation. Please read the guide carefully before trying to use the software. The motion software generates position demand cues for each of 6 actuators in a hexapod arrangement. The cues are based on calculated Pitch, Surge, Roll, Sway, Heave and Yaw movements to simulate flight forces and aircraft angle following. The geometry of your platform is defined in the motion driver configuration file and the software uses this definition to calculate the correct cues for each actuator. It can handle direct acting linear actuators (eg hydraulic actuators) or crank arm type actuators (eg motor/gearbox drives with a crank arm). The cues are fully tuneable to suit your application. The software can be downloaded using the links on the Online User Guide Introduction page. It will run with full functions for a limited flight time in demo mode. Please download and experiment with the software if you are interested in using it. The cost of a personal non-commercial use registration is UK�75. Please contact me for commercial use licensing. If you wish to order a licence please email me and I will send you a PayPal email invoice which will allow you to pay securely via PayPal. Your registration key will then be issued once you supply the PC ID generated by the software on following the registration prompts. Please note - I do not provide hardware for 6 DOF motion platform drives. To use this software you will need to make your own servo drive hardware arrangements (or see the updates below). The data formats in which the software exports the actuator position demands are described in the online user guide. UPDATE MAY 2016 - NEW interface for the x-IMU inertial measurement unit has been add to the Generic motion driver. See Section 19 of the user guide for details. UPDATE AUGUST 2015 - NEW 6DOF motion software version - this one for the flight simulator Aerowinx PSX. Check the online user guide for more details - Section 17. UPDATE MAY 2015 - NEW 6DOF motion software version - this one for the racing sim Project CARS. Check the online user guide for more details - Section 16. UPDATE MARCH 2015 - NEW 6DOF motion software version - this one for the motorcycle racing sim GPBikes. Check the online user guide for more details - Section 15. All main versions of the 6DOF software have been upgraded to V3.30. 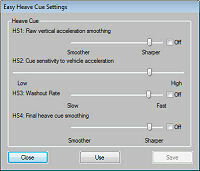 This version adds new "Easy" cue settings windows which provide slider based adjustment of the motion cues. This gives a more intuitive cue tuning. The original Advanced settings are still available if required. See Section 6B of the online user guide for more information. I've made available a beta version of a "Generic" 6DOF motion driver. This version of the motion software is not tied to any specific flight or racing simulator, but instead can be driven by user supplied vehicle motion data via UDP. More details and download from the Online User Guide. The UDP data format for the generic driver feed is described in more detail in Section 14. I've made available beta versions of the 6DOF motion driver for rFactor, Assetto Corsa, F1 2013, Live for Speed and iRacing racing sims. This might be of interest to builders looking to give their platforms a good workout! More details and download from the Online User Guide. He's recently had some success using Dimension Engineering's Kangaroo modules with Sabertooth motor controllers. I added the Kangaroo interface to the 6DOF software a while ago and it's interesting to see it in action.... DE's products are widely available. For more details of the interface see the user guide Section 8. Version V3.15 of the 6 DOF motion software adds portable USB Dongle licensing. The USB dongle allows a software registration to operate on any PC the dongle is plugged into. With the normal non-portable registration your unlock key works only on your specified PC. For more details click on the Dongle image on the right. I've added an experimental interface to the X-Plane and FS9/X versions of the software to export actuator position demands directly to Dimension Engineering Kangaroo motion controllers. For more details see Section 8 of the on-line user guide. The Kangaroos provide an interesting alternative approach to building a 6 DOF drive using the larger Sabertooth dual channel DC controllers. Here's a movie clip of one user's platform drive - it uses the X-Plane version of the BFF 6 DOF Motion Driver and Thanos' control hardware. Copyright � 2006-2016 BFF Design Ltd All Rights Reserved.